Stuart asked “What was your best plant bargain?” and as a frugal gardener I have had a few. It is hard to just pick one, things being relative 🙂 Last year I picked up some lovely hydrangeas I’d been wanting… for about five dollars each, in large containers. I’m always looking over the specials and end of season offerings. I think the best haul had to be the year I snagged two ‘Harry Lauder’ filberts and two hinoki cypress (which are false cypress or ‘Chamaecyparis’). Those bargains were available after the season was over, in the fall. Which is often a very good time to get trees and shrubs on sale. Midsummer is also a time for garden bargains, but it can be more difficult to keep the new plants alive in summer’s heat and dryness. I’ve always had more than my fair share of “false bargains”, where enthusiastic optimism in buying the plant was greater than the determination to get it in the ground and nurture it. I have to watch myself on that one! Sometimes a false bargain is the half-dead plant. However, you need to know that healthy plants give a much better outcome and that is really what you pay for. Sometimes that green thumb just insists on taking over, when the head knows better than to try. I have to cut short this little post- Thunderstorms have arrived!!! In February!!! What can I say? Ohio…. It was up near 60 degrees today…. 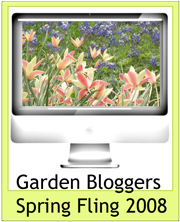 There is a garden bloggers “Spring Fling” get together which would be so terrific to attend. I won’t be there, but don’t feel too sorry for me, I will be returning about that time from Maui. YES! I am taking up an invitation from a friend and going to Paradise for a couple weeks- my tickets came in the mail today. If it weren’t for that… I sure would have liked to attend the Spring Fling and hear the great speakers like Kathy from Cold Climate Gardening. I hope it is a success and they do it again next year… maybe I could time things better and be there. I hope that the Spring Fling participants will be sharing their experiences and newly-acquired knowledge with us. Those Hydrangeas were a good bargain!